In July of 2016, Tropical Cyclone 05W was approaching Hainan Island, China. Now, two years later in 2018, another storm, also the fifth of the year in the Northwestern Pacific Ocean, Tropical Cyclone 05W is again approaching Hainan Island. 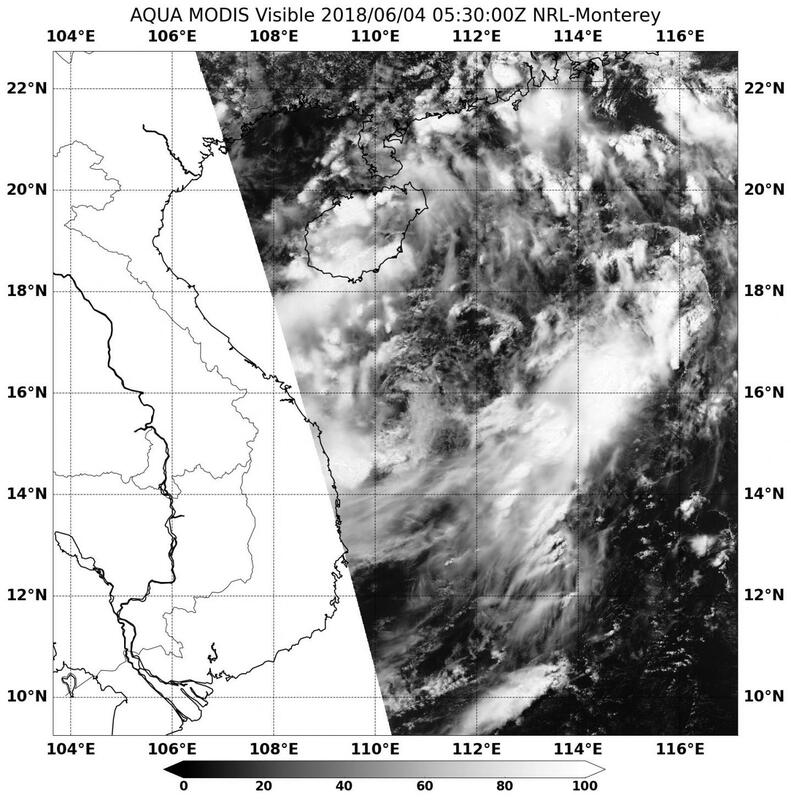 On June 2, Tropical depression 05W formed near 13.2 degrees north latitude and 111.2 degrees east longitude, about 238 miles southeast of Da Nang, Vietnam. 05W was moving to the northwest at 13 knots and had maximum sustained winds near 25 knots 28.7 mph). NASA's Aqua satellite passed over the South China Sea. On June 4 at 1:30 a.m. EDT (0530 UTC) the Moderate Resolution Imaging Spectroradiometer aboard NASA's Aqua satellite looked at the storm in visible light. The image showed the center of circulation south of Hainan Island. A band of thunderstorms north of the center were already over Hainan Island. Another band of thunderstorms were wrapping into the low level center from the southwest. The Joint Typhoon Warning Center forecast calls 05W to move north and make landfall in southeastern Hainan Island by June 5 at 8 a.m. EDT (1200 UTC).